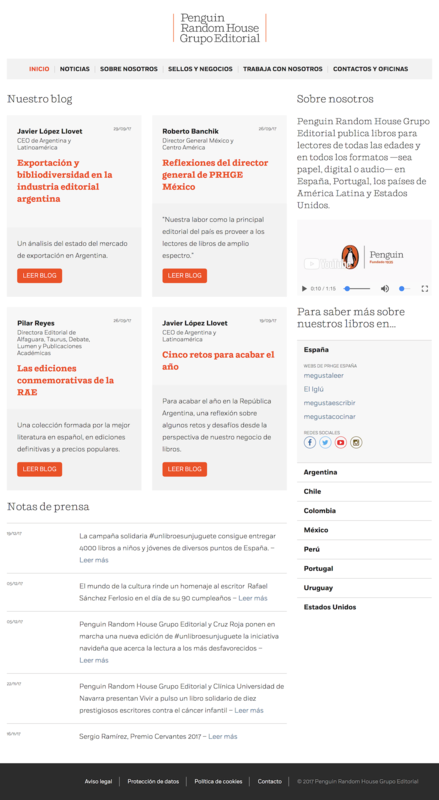 Our responsive WordPress site presents the corporate aspects of Penguin Random House Grupo Editorial to their geographic market, in Spanish. The site is a repository for all the structural information about the company (who are the directors and managers in each nation; which subsidiaries and publishing imprints are under the PRHGE umbrella; where are the offices; which websites and social media accounts belong to which arms of the group; which books are available for Foreign Rights deals; where should prospective candidates send their CV). The homepage carries a mixture of press releases, blog articles from the management teams, and essential structural information / overview of the Group. Inner pages (respectfully) use the corporate identity of Penguin Random House HQ. We’re building several other sites for PRHGE, and aim for consistency of styles and component reuse where possible. 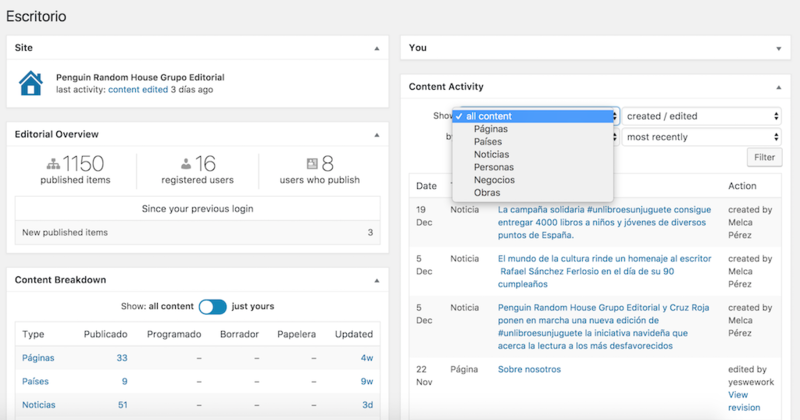 With over 1,000 pieces of content, an international editorial team of 16 (8 of whom write / publish), it was essential to have a better dashboard overview of content and activity than WordPress provides by default, so we used the Fabrica Dashboard for WordPress to make updates and content audits of the multiuser site easier. Yes, that’s our plug for our plugin.